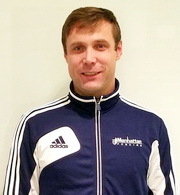 Coach Alexander has 17 years of competitive experience and 12 years of coaching experience. In 2002 Alexander graduated from Belarusian State University of Physical Culture and Sports with a Master Degree in Physical Education and Fencing. Alexander started fencing at 6 years old. 5. Europe Championship 2 place (team) – Gent (Belgium). 6. World Championship 6 place (team) – Sankt-Petersburg (Russia). 1. World Cup 3 place (ind..Lapkes D.)- Teheran (Iran). 7. Olympic Games 5 place (team) – Beijing (China). 8. Olympic Games 8 place Buikevich A. (ind.) – Beijing (China). 2. World Cup 3 place (ind/ Priyemka V.) -Istanbul (Turkey). 6. World Championship 6 place (team), Antalya (Turkey). 5. World Championship 2 place (team) – Catania (Italia). 5. World Championship 7 place Lapkes D. (ind.) – Catania (Italia). 3. Olympic Games 7 place (team) – London (Great Britain). Throughout his fencing career, Mr. Sourimto was the head coach for the Belarusian National Team from 2008 to 2014.